PLEASE NOTE: There is a 20% restocking fee for returned kits. The EQUImeasure Kit Saddle Fitting Tool is a universal tool that can be used and re-used to check the fit of any saddle and for any riding discipline. Invest in your equine’s health and performance and check your saddle fit. Proper saddle fit is one of the most important elements of equine health and performance. Over time, poor saddle fit can trigger behavioral problems, induce physical ailments, and limit equine potential. In addition, equines–like humans–change physically over time. Age, activity type, conditioning level, nutrition, and injury can all affect how a saddle fits an equine back. The proprietary EQUImeasure sheet is made of materials similar to those used in veterinary and medical applications globally for over 25 years. The EQUImeasure sheet is non-toxic, hypoallergenic, non-stick, and emits no fumes. Best of all, equines truly enjoy the warm sheet placed across their backs. The EQUImeasure Kit Saddle Fitting Tool can be used by riders of every discipline and in every stabling situation. All you need to use an EQUImeasure Kit is an oven, oven mitts, and an equine. The EQUImeasure sheet can be re-used several times. 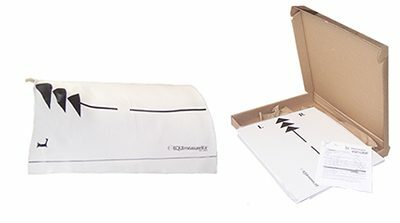 Learn how to use the EQUImeasure Kit! Click here to see Video instructions on YouTube.